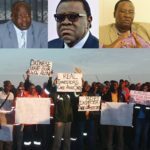 Pictured: Erongo Regional Governor, Cleophas Mutjavikua, the President of Namibia, Dr. Hage Geingob, the Secretary General of the NUNW Job Muniaro and protesting workers of the Husab Mine. 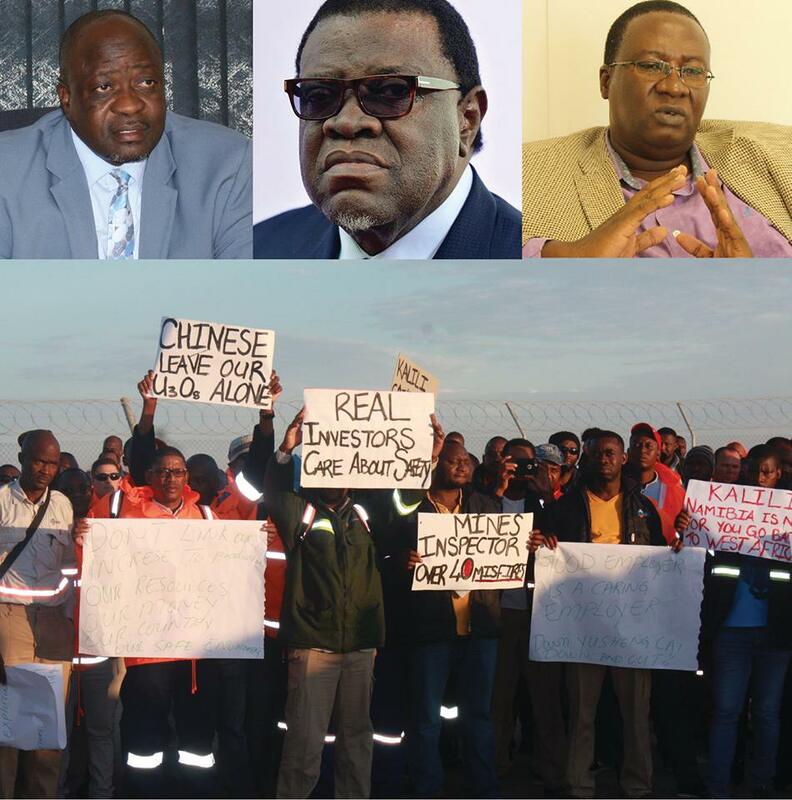 A SECRET recording of a meeting between the Erongo Regional Governor and once influential unionist, Cleophas Mutjavikua and the Chinese management of the Husab Uranium Mine on a possible restructuring, including a pay and benefit cut for workers, circulating on social media platforms caused a political firestorm sucking in the President, Dr. Hage Geingob. The Swapo Workers Federation, the Namibian Union of Namibian Workers, is demanding the head of the Governor, while Mutjavikua fired off a press release describing the recording as “edited”. The Chinese management who was party to the meetings is keeping their silence in what is exposed as an incestuous relationship between political appointees, labour union representatives and Chinese developers again dragging the President into a peaceful protest of Husab workers on safety lapses at the mine. The recording allegedly from the veteran unionist, who was ironically promoted to Governor of the Erongo Region due to his union background, Mutjivikua, and the Chinese owner of the mine, is the latest of an internal Swapo political campaign exposing division and a growing credibility crisis on all levels. The rights of workers in the mining sector in the Erongo Region has been tempered with the Governor and it’s so called good friend of Husab. Therefore, the NUNW are condemning the action and re-organising advices of the Governor to Husab to look for ways to reduce the condition. If employment of Namibian Workers are understood wrongly then, and the Governor has it the other way round by advancing un-employment to the Namibians. When the union leaders say the troubles in the working environment is created by some of our leaders we mean it, it is true you have clearly heard it now. We thought, the Erongo region has a leader, but now we realise that the workers of Namibia has no leader in Erongo. So Painful! 3. Make sure that through this re-organising the recognition agreement get cancelled. – Now you know when I said there is no truth in any retrenchment in Namibia by lying to workers about economy, finances, safety and prices downfall. Government Company telling you about price downfall. Big lies. 6. They must use their experts to fabricate all lies. They know how I advise you. 8. That this would be a challenge for unions if you involve re-organisation clause in the labour act. 9. He apparently know that he is on all union tables. 10. What doo you mean by saying this is election year and President will be angry with you? Does this mean you don’t need workers at all, but they are only needed by the President, because you are just appointed? Does this mean workers must not vote for your appointing authority? Be clear today. So we also know what is on your table, there is in fact only destructions on your table. The Erongo Governor has failed all Namibians, but not only Husab workers alone if not the world workers and its entire leadership. He in fact embarrasses the President who tirelessly fights for employment. Who has unknowingly put his trust on an unemployment time bomb. We therefore request the President to recall the Governor with immediate effect and place him nowhere as he is a danger to all employment in Namibia. We call on government to have 50% in all mines with immediate effect. Chinese government who has made themselves untouchable in this country of the brave, you will be touched if you touch the workers through your ill advice. The Regional Governor was requested by the active partners to labour relations, namely the Mine workers Union Husab Branch and the Husab management to mediate on their substantive agreement for 2019 as I did all these years. I never never ever had secret meeting, but was mediating. The meeting started on the 18 February 2019 in the afternoon and again on 19 February 2019 in the afternoon. In the edited audio that is circulating or the unedited audio not being circulated, I NEVER MENTIONED THE WORD RETRENCHMENT AND JOB LOSSES AT ALL nor did I advised the Company to retrench. I did made it clear to the Company that NO ONE MUST LOSE THEIR JOBS. Indeed I referred to re-organising clause in the labour Act on a question relating to systems and processes which the Company wanted to be addressed. The issue of processes and systems became a sticking point in negotiations as the mine insisted on linking half of the annual salary increases on the performance of the company. My advice to the Company was that there is a recognition agreement, that is only referring to an annual substantive negotiation, but not the linking of annual salary increases to the performance of the company. In addition, the management was referring to a three years substantive agreement that is an arrangement totally contrary to the recognition agreement. My advice was that the only legal way to address the issue of system is by following the labour act. It is important to state that those who unethically released the edited circulating audio, must release the whole unedited audio on the caucus between the Governor and the Union as well as the unedited audios of the whole two afternoon negotiations will provide a proper perspective of whole negotiations process and not the distortion of facts and discussions as being taken out of context as of current by circulating selective audios. On the health and safety challenges in the Open-pit, the Office of the Governor adviced the Management already to ensure that all safety measures are followed to make sure that no one is getting injured by the blasting devices that are not exploding as is the current incident would have resulted in multiple fatalities. I further advised that all workers that are refusing to work in the Open-pit, must be paid in fully for the duration of this challenge. a) That the mine must acquire land to build houses for the workers. Our office addressed all these issues on various occasions , but progress i not forthcoming. The mediation role was to assist the parties to reach consensus and not to impose positions on the parties.